You will use a real sword and targets to practice Bushido in this experience. 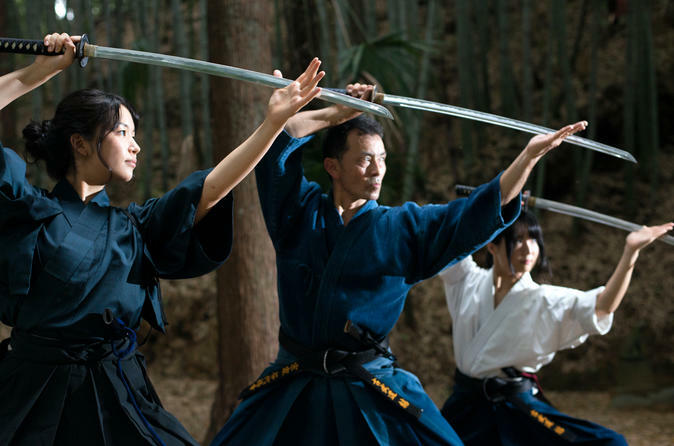 If you’re interested in Japanese martial arts, Samurai or Bushido culture, then this must-try experience is perfect for your next adventure in Japan! This crash-course lesson will introduce Kobudo, a cultural tradition of Japanese martial arts that dates back to over 700 years ago. Kobudo is a rare skill that’s never-seen seen in competitive games because it’s based on the ability to deliver a fatal blow. In this experience you’ll learn the history and core spirt of Kobudo, all while practicing three authentic Japanese martial arts, including Karate, Jo and Iaido, in the same method samurai once did. You’ll acquire the basic skills used to wield a Japanese sword properly, practice how to handle an opponent, and step in the shoes of a samurai warrior. As a special highlight, you’ll also get to defeat a straw target with a Katana, a real Japanese sword. Whether you’re a novice or experienced participant, this immersive look at the culture of Japan’s samurai will become a one-of-a-kind memory (and amazing photo op’!) during your travels in Japan.